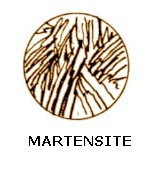 Martensite is magnetic and hard brittle mass of fibrous or needle like structure, it contains carbon upto 2% and it is main constituent of hardened steel. This is a body-centered, tetragonal meta-stable iron phase produced by entraping carbon on decomposition of austenite when the rapid quenching of high carbon steel from a slightly higher temperature than the maximum temperature of critical interval. We may note that the decomposition of austenite below 320°C starts the formation of martensite. It is not as tough as austenite. It is differs from austenite in being magnetic.